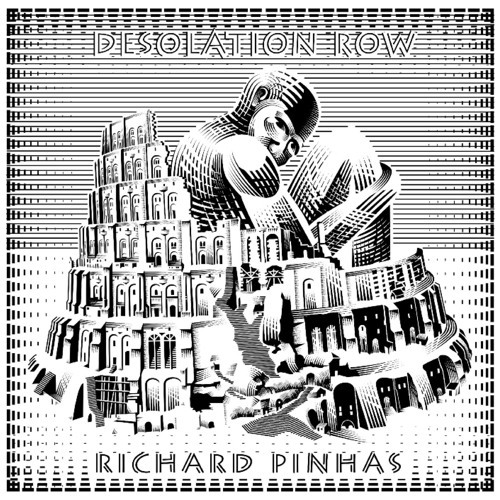 PURCHASE 'Desolation Row' by Richard Pinhas @ AMAZON (digital & physical): http://www.amazon.com/Desolation-Row-Richard-Pinhas/dp/B00BSE4EZO WAYSIDE (physical - ships worldwide): http://www.waysidemusic.com/Music-Products/Pinhas--Richard---Desolation-Row__Rune-spc-366.aspx ITUNES (digital): https://itunes.apple.com/us/album/desolation-row/id644225571 BANDCAMP (hi-fi digital): http://cuneiformrecords.bandcamp.com/album/desolation-row “The big crisis is coming now in Europe,” says avant-rock icon and philosophy PhD/writer Richard Pinhas. “'Desolation Row' is an image of what we can Feel and See coming during this neoliberalist era... neoliberalism transforming ultimately into TEKNOFASCISM...the real Big Brother!” Morally outraged by the corporate greed that caused Europe’s (and America’s) 21st century economic collapse, shattering the public’s (the 99%) wellbeing and undermining democracy itself, 'Desolation Row' finds Pinhas returning to his philosophical and artistic roots and resuming his stance behind political barricades. His newest solo album is as politically charged, musically radical and artistically potent as those he created with his band Heldon during a prior era of socio-political change. While a young student at the Sorbonne, studying under French philosopher Gilles Deleuze, Pinhas had manned the Paris barricades during the May 1968 student uprising. Experiences from those years would infuse his later work, in a music career launched in 1974 when Heldon released its debut recording, Electronique Guerilla. 40 years later, the original Electronique Guerilla re-arms himself with guitar and electronics as weapons in a stance against Teknofascism. Says Pinhas of 'Desolation Row': “Music is a way to fight...and to bring weapons to people, to make them feel outside of their servitude, and perhaps to make them happy, even for one minute...a way to fight THE POWER!” But beyond marking his return to political fire, 'Desolation Row' finds things coming full-circle for Pinhas in other ways. In a career spanning more than 4 decades, pathfinder Richard Pinhas has remained continually innovative, pioneering groundbreaking developments in electronic rock and industrial music and influencing generations of musicians. In a major creative surge over the past several years, he has released numerous recordings – many of them double-disc releases – in collaboration with noise and experimental musicians, breaking further sonic ground. 'Desolation Row' finds Pinhas collaborating with those he has directly or indirectly inspired and influenced, with the results in a class by themselves. While his roots are in progressive rock, electronic music, philosophy, and science fiction/literature, 'Desolation Row' finds guitarist/composer Pinhas in the company of some of Europe’s cutting-edge performers in the frequently-overlapping spheres of jazz, progressive rock, free improvisation, and noise — Oren Ambarchi, Lasse Marhaug, Etienne Jaumet, Noel Akchote, Eric Borelva, and his son, Duncan Nilsson — engaging in a series of six distinct works which stimulate and push all concerned through and beyond their comfort zones. 'Desolation Row' is a work that stands both with and apart from the respective oeuvres of its principals. The continually evolving Pinhas reaches ever-newer artistic vistas – and draws attention to Europe’s sociological, political, and economic turmoil on 'Desolation Row'. Far from being an “elder statesman,” Richard Pinhas is in the thick of things, continually reinventing his musical conceptions, recognizing no conventional constraints. This Spring brings a tour of Japan where he will have live encounters in at least four cities with Kenji Haino, Yoshida Tatsuya, and Merzbow. Summertime will find Pinhas headlining the 2013 SONAR Festival in Spain as a duo with French Catalonian electronica icon Pascal Comelade. Continuing on a creative surge, Pinhas’ plans for future recordings include works with Tatsuya, Ambarchi, and San Franciscan Barry Cleveland, as well as others. Collaborating with established icons and young newcomers alike, Pinhas is a lynchpin in the current noise / electronica / experimental music scene, uniting diverse elements to forge music that is relevant, forceful and new. In addition, two documentary films are currently in production about Pinhas and his music. As this decade brings even more potent and disorienting change, it will have a most pertinent “soundtrack” courtesy of the protean artist that is Richard Pinhas. Okay, this is a blast! I've been listening to Richard for years (over 15~) an excellent sound musician! My best. This is like Heldon goes to outer space. Wow! Taking it way out there. Es todo un viaje !!!!!! !